FROM UNDER TOWELS, where the tears flowed unceasingly, she could hear it: the cheers, the chants and the words of encouragement. The heart of Kerie Hughes hung heavy with disappointment. It was Saint Patrick’s Day and, with a little luck, Hughes and her Seattle Pacific teammates planned to end it by climbing a ladder and cutting down the nets at Brougham Pavilion. They would stand undefeated and be bound for the Elite Eight. But it was not to be. After 29 consecutive victories, after becoming the darlings of the Puget Sound sports scene for more than a month, and after going into the locker room with a 10-point halftime lead in the NCAA West Regional championship game — after all that, the Falcons suddenly found themselves eliminated. March Madness is exciting, even euphoric, for those who win and move on. But the mood quickly changes for those who do not. Sixty-four teams make the playoffs, and only one is left standing. All it takes is one loss. One minute you’re pumping your fists to celebrate a swished three-pointer and the next you’re under a towel. It was a great season of basketball for Hughes, Coach Gordy Presnell and all those involved. They had gone unbeaten throughout the 27-game regular season, claimed the Great Northwest Athletic Conference crown and held the nation’s No. 1 ranking for five consecutive weeks. Perhaps more importantly, their superlative play had won them a growing legion of fans. And as Hughes, a senior, walked from the court one final time, she was uplifted, albeit briefly, by chants of S-P-U, S-P-U. From the day that Seattle Pacific first reached the No. 1 ranking, interest intensified. Reporters and camera crews greeted the players’ arrival at practice. Many were there when Presnell made good on promise and allowed his head to be shaved by 14 young women bearing shears. In the final nine home dates, the Falcons averaged more than 1,200 fans and broke their single-game attendance record four times. Apart from all the records and achievements, what made this particular SPU team so special was the joy they exhibited, both on and off the hardwood. Presnell says his program, now 16 years running, is founded on three principles: confidence, chemistry and competitiveness. From the moment the previous season ended until the fateful 85-80 loss to fifth-ranked Cal State Bakersfield, his team was a model of commitment to those qualities. “ We wanted to be the best,” Presnell says. “We played with a great deal of confidence (beating six nationally ranked teams along the way), and everybody got along and was unselfish. Everything was fulfilled.” Hughes; fellow seniors Stephanie Urrutia, Kelley Berglund and Stacie Lukkes; and fourth-year junior Kristin Poe had all stepped forward to fill key leadership roles. They invested themselves in achieving something special, and the rest of the team believed in their ideals and the possibilities. Everyone played a role. Eleven players saw regular action, including three freshmen. Eight different women led the team in scoring throughout the year, and Berglund, the overall top scorer, averaged a modest 14.7 points. Individually, the statistics may not have been impressive. Collectively, SPU overpowered opponents, winning games by an average of 22 points. “That overall vision was always out in front,” Hughes said. 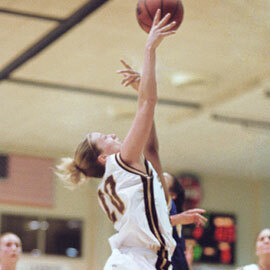 Although Hughes was voted the GNAC Player of the Year and both she and Berglund were honorable mention All-America, the team’s dream was always bigger than any one player. Hughes and Urrutia arrived for their final game weakened by flu-like symptoms and visibly pale. Adrenaline carried them early, but Hughes said fatigue took hold in the end. Still, she and her fellow teammates remained true to themselves.